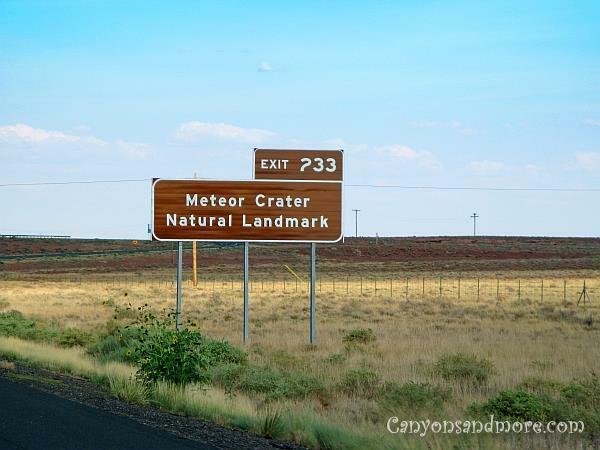 If you drive east of Flagstaff on the I-40 for about 35 miles, you will find exit sign for the meteor crater. 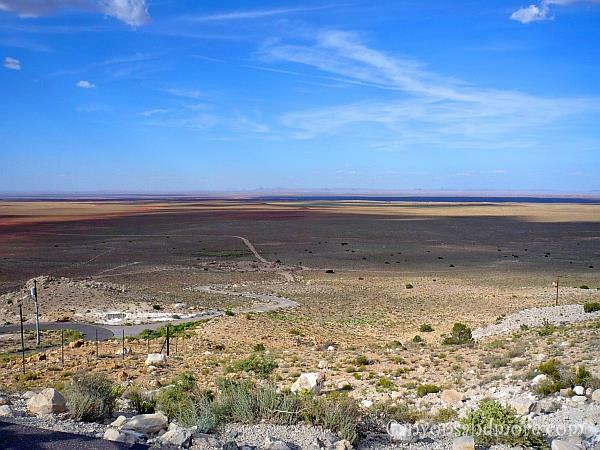 Off in the distance you will notice a raised hill in the horizon and it looks like what could be the meteor crater. At this point it is hard to tell but the closer you get to, the more obvious it becomes that it is definately the site of the crater. The entry fee as of July 2008 was $15.00 per adult and it allows you to see the crater and visit the crater museum and gift shop. Above you see how the damage of the meteor left its scar on the otherwise flat Arizona landscape of this area. 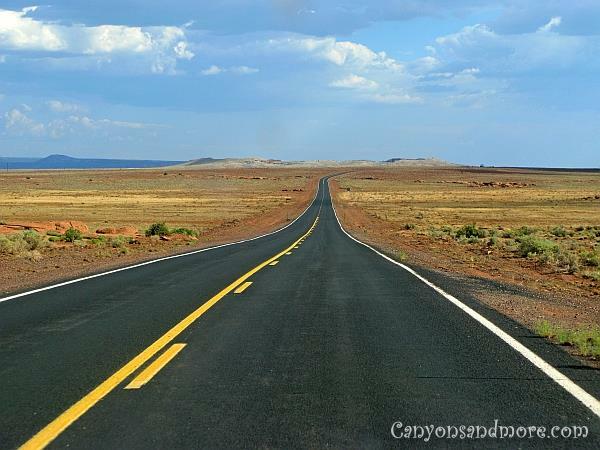 The highway leading to the crater takes you through a vast countryside with desert like conditions. Get off exit 233 and follow the signs directing you to the crater. 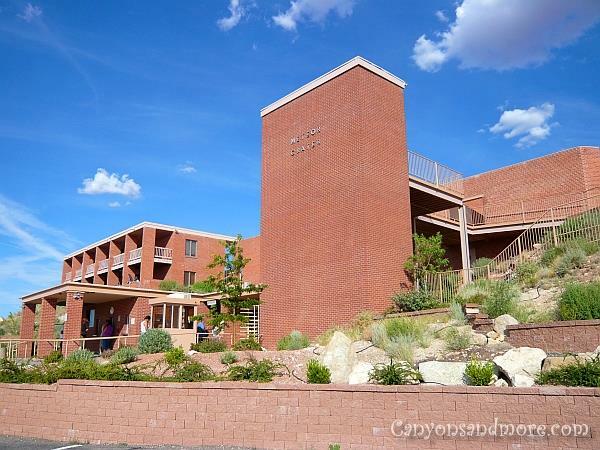 Not only will you get to see the meteor crater, but also you can go through the museum to find out lots of fascinating details about this site and about meteors in general. 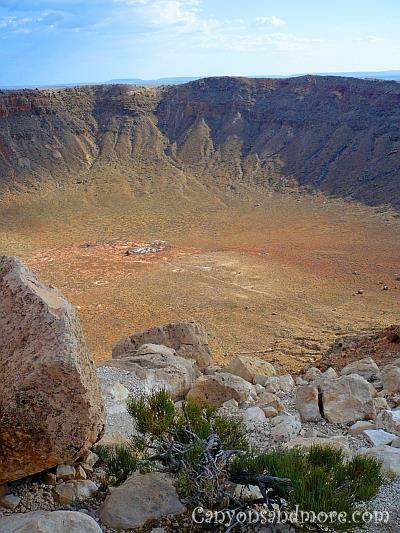 Once you have seen the museum (or you can do that last), you can go out to the site of the crater. 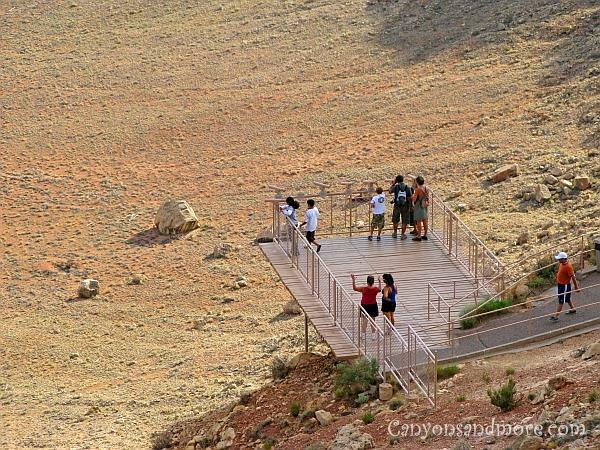 An observation platform gives you the possibility to see it from a closer view. There is no way to walk down into the crater itself. 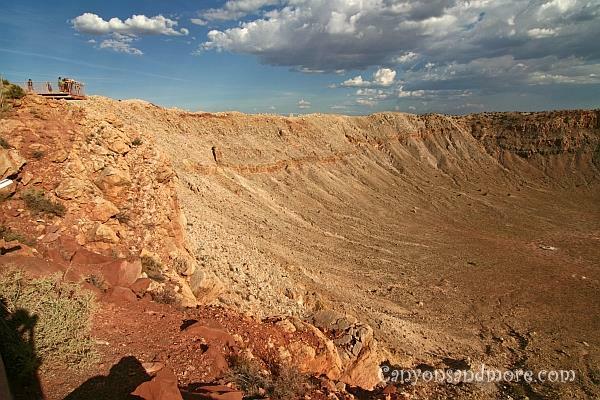 Information on a sign said that 50,000 years ago, a meteor that was only 45.7 meters or 150 feet in size formed this crater in Arizona that is 1.6 km or 1 mile across. 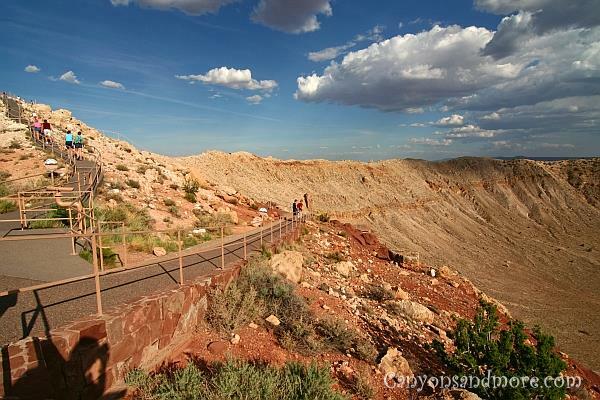 Along the crater rim, there are walking paths, so you are able to look down into the crater. It is not allowed to enter the crater itself, though. Notice how small the people look when standing at the rim of the crater. It is amazing to see what damage a small meteor can cause. The site is a chance to see how the earth below you is formated. 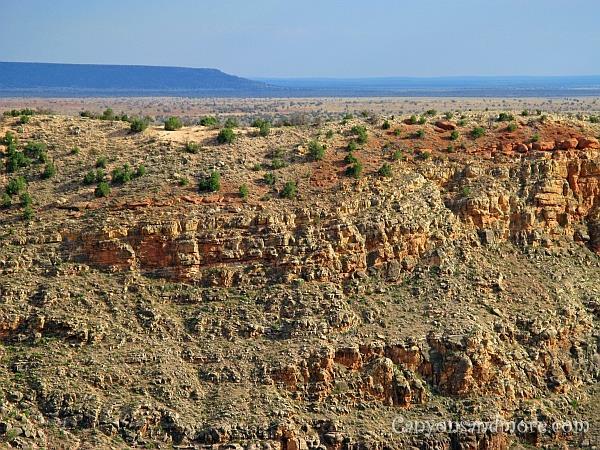 Layers of rock tell the stories of past eras of this landscape. While looking at the crater, it does not feel like you are even on this planet, but instead, on a distant lunar landscape. The landscape around the crater was unbelievably vast, flat and uninhabited. 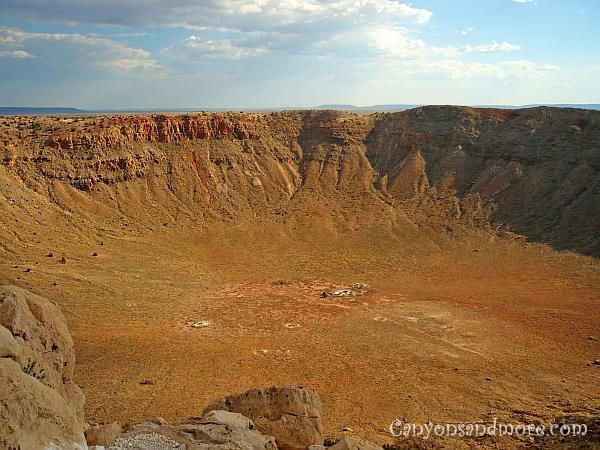 This is probably how it also looked tens of thousands of years ago as the meteor hit the area.